As I did with the “Presto” short that preceded “WALL·E“, I’ll begin this review with a quick take on the animated short attached to “Up”, appropriately titled “Partly Cloudy”. This cute little story concerns clouds that create newborn life for storks to deliver around the world. It’s a charming and adorable effort that ranks right up near the top of the Pixar shorts. I still would put “Presto” and probably even “Boundin’” or “Lifted” above it from an entertainment standpoint but “Partly Cloudy” is a perfect way to lead into “Up”, both thematically and tonally. So, while one should never be late to a film in the first place, this is a reminder to show up early for this, and any Pixar film, because their shorts are definitely a great inclusion to the features they release and often will show up again come Oscar season … so at least you’ll have seen one of the animated shorts, which is better than none. On to the featured film at hand, let me get this out of the way. I’m going to refer to Pixar’s previous triumphant work “WALL·E” … A LOT. This isn’t so much an attempt to show how “Up” failed to meet those expectations but it’s the only other film I feel comfortable in comparing it to. The simple truth is that Pixar has managed to make consistently good films, time and again – regardless of the fact that it’s split between a number of top-notch directors. Even “Cars”, which I consider their weakest effort, is a far cry better that 95% of Hollywood’s animated efforts – and overall, Pixar tends to put films out that are probably better than 85-90% of any others of their time period, animated or live-action. The key to their success over the last 14 years (“Toy Story” was way back in 1995 making their run all the more impressive) isn’t the use of computers, a business relationship with Disney (who would be dead in the animated market without Pixar) or even the amazing voice-over work done by a bevy of talented actors (big-name or otherwise). No, what keeps Pixar at the forefront of today’s cinema is storytelling. They seem to be the only studio that completely understands that the key to any quality film is a good story. If the characters and their journey aren’t developed within that framework, you get just about any Shia LaBeouf film. When done right, you get films like “Up” (notably the first animated film to open the Cannes film festival). The story here revolves around a cantankerous old man, Carl Fredricksen, voiced beautifully by Ed Asner (after his excellent work in “Gigantic“, he’s on the fast track for most impressive body of work in 2009). Carl decides to bring his whole house with him to a legendary spot in South America he learned of as a child and attaches a plethora of helium-filled balloons to the chimney to get that done. A young stowaway (Jordan Nagai) is discovered and the pair then must work together to get the house to just the right spot, all while befriending local wildlife and escaping the clutches of a demented explorer (Christopher Plummer) hellbent on regaining his former glory. The beauty of the film derives from understanding that Carl wasn’t always so crabby – and obviously, he wasn’t always so old. Told through a flashback at the beginning of the film, the audience will see how Carl came to be living in that house and the events that shaped him into the man he is today. This sequence, done without narration or dialogue, would surely deserve multiple awards for best short film (animated or otherwise) if it wasn’t already an integral component of “Up”. It’s possibly even more impressive than the opening 20 minutes from “WALL·E”, though it’s still a toss-up in my mind and I’m trying to factor in that I just saw “Up” so the bias of being newer shouldn’t be ignored. This brings up the issue of whether or not “Up” will be able to appeal to kids, as was the concern with “WALL·E”, because of the filmmakers use of long sequences devoid of the usual chatter that todays TV and film content tends to employ in an attempt to fight the short attention span of the modern consumer. Partially because it is a computer animated feature, I doubt that parents will have any more difficulty with their children than they would for any other film of its ilk (though if you have a crying infant, please do the theater a favor and take it outside … I’m trying to watch the film). I didn’t notice more children than usual acting up or running up and down the aisles in an effort to combat boredom (as was the case with “Earth“) so assuming your spawn have attended other feature-length fare (this one’s 96 minutes), they’ll do fine. Bringing the film’s characters to life are a host of good actors (new and old). The aforementioned Ed Asner crafts a character that’s completely believable as an old man ready to be free of other people’s concerns with the spirit of a young whipper-snapper ready for adventure. While there are plenty of elements in the film where his character acts like the spryest pre-Baby Boomer ever seen (vaguely reminiscent of the grandmother from “Hoodwinked“), it’s all in the spirit of fun and the whimsy of animated films. Young Jordan Nagai was cast as the kid who stows aways inside the house before it floats away and it’s so refreshing to see that Pixar gets how vital it is to cast kids as kids (yes, I’m pointing a finger at Matthew Broderick and pretty much the rest of the cast from “The Tale of Despereaux“). While I’m sure a more seasoned actor would be able to inflect greater range of emotion into the character, the beauty of Nagai’s read is that it’s so genuine. His lines sound how one would expect a real kid to deliver them (obviously because he is one) … which is the point after all. Co-director Pete Docter even enlisted his daughter Elie Docter to play the childhood love of Carl, appropriately named Ellie (I guess the extra “l” is to meant protect the names of the innocent). While it isn’t a big role, I think it’s so wonderful that Docter and the rest of the Pixar family continue to make each film such a close-knit affair. While one might normally frown on nepotism (frepotism misses the exact point here, sorry Elizabeth), as long as the filmmakers are still serving the story first and foremost, I’d rather they cast their own kid than see if they can snag whatever pre-teen is the current fad. Additionally, the great Delroy Lindo and screenwriter/co-director Bob Peterson provide fun voices for the main dogs (there are a lot of dogs … like, a lot of dogs) that all can speak English, thanks to some technological help. Whereas the story of Carl and his journey is what will keep adults fully engrossed in the film, it’s the antics of the dogs that will keep Junior (we named the dog Indiana) firmly planted in his seat and ogling the screen. A key component of any film, especially that of an animated feature that relies on sequences without dialogue at times, is the score. Oddly enough, composer Michael Giacchino, who I derided for his bombastic tendencies with the score for “Star Trek“, managed to provide music here that seemed to fit. While this didn’t have some of the prettier melodies that Thomas Newman injected into “WALL·E”, I never found myself cursing the orchestra … which is a far cry from my experience on the Enterprise a few weeks ago. Summing “Up” (I couldn’t resist that pun), the film marries a heartfelt story with quality technical components and excellent voice-over work (with perennial favorite John Ratzenberger keeping his streak of Pixar films alive here). Fans of Pixar’s previous efforts will find this to be another gem in their crown and I’ll leave it up to each of you to decide just how to re-rank your favorites once you’ve seen this one. My gut reaction was to give the film a 5 out of 5, and after a second viewing, I’m going to stand behind that notion. Keep in mind that I do so while separating the 3-D novelty from the film’s merit. Many of you may go looking for this in 3-D because that’s the exciting thing right now but go ahead and save those extra bucks to buy popcorn or gas. While it wasn’t terrible or an annoying distraction, adding the third dimension didn’t provide any significant addition to the enjoyment of “Up”. The technological incorporation bar is still set by “Coraline” and I’m hoping that sooner than later, I won’t have to keep pointing that out. Compounding this problem is how the 3-D glasses dull the colors of a film, simply because they are shaded lenses. 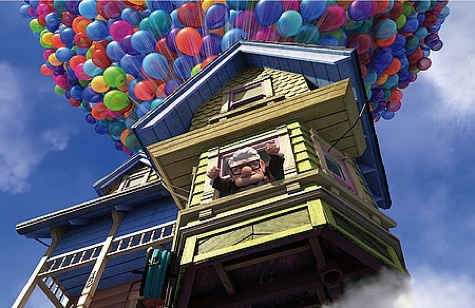 Much of the beauty in “Up” is the bright and beautiful color scheme … slipping on those shades takes some of that away. So when presented with a choice this time around, I say choose the 2-D version – the great story is still there and the colors are fantastic … and because the 3-D was rather weak, there were only one or two scenes that I vaguely missed seeing in the extra dimension. However, regardless of how you decide to watch “Up”, the important thing is that you do it. This lacks a little of the cuteness that “WALL·E” brought but the inclusion of packs of talking dogs and a huge, colorful bird should keep the little ones entertained while you can enjoy the deeper layers underneath about family, loss and revitalization. This is the only film of 2009 so far to be a must-see … so go see it already. Sobering Conclusion is powered by	WordPress 3.1.4 and delivered to you in 0.344 seconds using 36 queries.